For most visitors to Tzfat, the Tzfat experience revolves around the visit to the Old Jewish Quarter and the Artists Quarter. The windy lanes and stone homes, ancient synagogues, historical points of interest and art galleries all allow tourists to wander and explore. 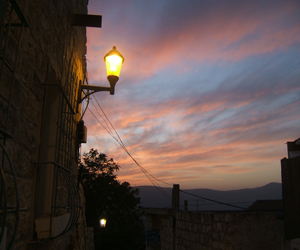 Visitors who stay overnight in the area tend to stay at one of the hotels in Tzfat, or sometimes, in nearby Rosh Pinna. But for those who want to have their hotel be an experience in itself, the nearby Mitzpe HaYamim Spa is a marvelous choice. Mitzpe HaYamim is located along the old Tzfat-Rosh Pinna Road, in a secluded area of the woods. The spa's architecture was carefully planned to balance man and nature, and one feels it from the moment of arrival, as one enters the spa through the grounds which are made up of fragrant gardens, walking paths, pools and running water. Mitzpe HaYamim is known for its attention to detail - the lobby offers a variety of herbal teas and coffees which are always available to guests as they sit in the spacious open area, relaxing before a tour of Tzfat, after a walk in the gardens, or while waiting for a massage treatment. Visitors to the spa have their choice of activities on the premises, ranging from the fitness room which boasts a full range of exercise equipment, both indoor and outdoor Jacuzzis, a dry and wet sauna, and a swimming pool. A special treat for visitors is the organic farm which operates on the spa's site. In recognition of the spa's goal to create harmony of man and nature, the organic farm cultivates and produces all the organic items served in the hotel's restaurants. Visitors can walk around the ecological farm and see the process of nurturing the soil and growing the fruits and vegetables, which are grown completely free of chemicals and pesticides. A shop on the premises sells freshly picked vegetables and fruits, various types of cheeses, dried fruits, homemade breads and a variety of cookies, jams, fruit syrups and liqueurs, all made from the farm's produce. In addition, the cows, goats and sheep on the animal farm provide the hotel with milk, yoghurts, and cheeses while the free range chickens supply the eggs. The excitement of staying in a spa is, of course, experiencing the various treatments that the spa offers. Mitzpe HaYamim offers a wide-variety of massages and treatments, including a couples' treatment, massages with oils, dry body massages, AYURVEDA body treatments, facial treatments, beauty treatments, body peeling treatments, and more. As in any good hotel, the food served is very important, but at Mitzpe HaYamim Spa, much care is given to insuring that eating is an exceptional experience in itself. Two restaurants are on the premises for the convenience of the guests - the Muscat meat restaurant and the vegetarian restaurant. Both incorporate produce from Mitzpe HaYamim's organic farm in creating gourmet meals - the vegetarian restaurant offers fresh fish as well. Tzfat offers visitors a wonderful way to experience Northern Israel's history and spirituality. But for visitors who want to treat themselves to something a bit out of the ordinary at the same time, Mitzpe HaYamim is the place to be.